Do you want to improve your English Pronunciation? Here's some advice you might not have heard before: start acting silly. That's right: silly. It might be just what you need to help yourself reach a new level of pronunciation expertise. Before looking at some examples of silly American English Pronunciation practice, let's take a look at the reasons why this is actually an effective way to improve English pronunciation. When we are having fun, our muscles are usually more relaxed, and English pronunciation involves working with a lot of little muscles that don't always work as well when we are tense. For example, fun role plays can help people adopt an imaginary English persona, and reduce the anxiety they feel about making mistakes. So, let's try getting silly. First, stand up and stretch. Try to get your body relaxed. Now, stretch the muscles in your face by making silly faces and sounds. Roll your shoulders and shake out your hands. Whenever you find yourself feeling frustrated, stretch out again. Try to keep your body relaxed. Choose a short video clip of an actor or other person that you admire. You can record these from TV or the internet. Now play the clip and try to imitate the speaker. Don't just imitate their words or American accent, imitate their actions and expressions. Pretend that you are that actor, and walk around the room speaking his or her words. If your friends are also trying to silly practice activities, you can perform for each other later and see if you can guess each other's character. Keep standing for rhythm and intonation practice. Grab a pencil and move it like a conductor's baton as you practice rising and falling intonation. Open your eyes wide for rising intonation, and close them for falling intonation. Stand on the tip of your toes as your intonation rises, and bend your knees as it falls. 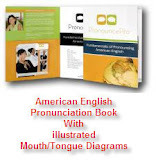 Practice changing the loudness of your voice during pronunciation practice. Choose words or phrases and whisper them, then speak them as loudly as you can. Feel the difference in your body as you change the volume of your voice. When you get tired and need a break, keep your pencil in your hand and as you listen to the English pronunciation move your hand in time with the rhythm that you hear. Try some of these activities for a change. If your family or roommates wonder what you are doing, invite them to join you for some English pronunciation fun!